Bloggiesta is a blogging marathon revolving around ticking off those items on your to-do list and improving your blog while in the good company of other awesome bloggers doing the same thing. Our awesome mascot Pedro (Plan. Edit. Develop. Review. Organize) is ready to break out the nachos, enchiladas, drinks, mariachi music and whack a pinata or two! It’s nothing short of an awesome fiesta! Here's to a successful Mini Bloggiesta! Did you participate? Did you accomplish most of the things you wanted to? Do you have that one blog chore that is particularly annoying? It sounds like Bloggiesta was a productive one for you! I totally know how endless tasks like Bloglovin can feel...sometimes I wonder if it will ever feel organized. Glad to hear you checked so many things off the list! Bloglovin' is the devil to me right now ;) At one point I thought I could follow every book blog in the world. Nope! Good job! I know how big a deal it is to organize Bloglovin, as I did that a few weeks ago! But doesn't it feel good to have it done? And all the other tasks? Congrats...and thanks for visiting my blog. My Bloggiesta was a success as well. It's amazing how as much as i like blogging there are so many little tasks that I dread and put off. Since this was my first Bloggiesta, i'm going back into the archives and working on at least one other small challenge every week. Awesome! It looks like you had a wonderfully successful weekend! I always miss out on Bloggiesta when it happens -- I really need to pay better attention because it's all 'housekeeping' I really need to do! I need to do that. Except I can't keep up with all the blogs I follow as it is! Interesting link from Tanya. Thanks for sharing it. Good ideas! Have a great week. It's always a growing process on the blog, isn't it? I'm thinking I'm going to not post my blog to my personal Facebook anymore. I'm trying to think that through. I rarely post my blog things on my personal FB page. I use my dedicated blog FB page for that :) Maybe you should consider making one of those? Yay you! Good job on accomplishing so many tasks! I completed both of mine, so I'm happy with the results. Thanks! :D Good for you, Melissa! You did really well! I didn't do any of the writing- or book-related stuff on my list, just the techie and the social! I'm wondering if Google+ is going to start gaining on Facebook now, too. I'll have to check out the article. I have a feeling that it will. I don't like it as much, but that's probably just because I'm not used to it? Time to start using it more! Dude, I'm so impressed at what you've managed! I tip my hat to you! 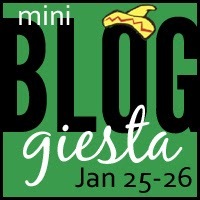 I didn't participate in Bloggiesta, but I think I might use some of the mini-challenges in the next month or two. There are so many great ideas here! You did all that in a weekend? You go, girl! The FB thing is pretty annoying, but I guess it's just part and parcel of them becoming a publicly-traded company -- they're looking to make money now. Maybe I'll have to rethink Google+ -- but because I work freelance for the publishing industry (in nonfiction, not the fiction I mostly review), there could be a perceived conflict of interest that I avoid by NOT having my real name associated too closely with my blog. And if I do ever go Google+, I need to associate it with my business, not my hobby. How do you organize Twitter? I'm a real newbie on there, despite having signed up a good 5 months ago or so.